A good investigator needs a place to record his thoughts and observations, and this amazingly detailed Twin Peaks Microcassette Mini Journal from Bif Bang Pow! should fit the bill. 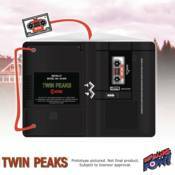 It looks just like the microcassette recorder carried by FBI Special Agent Dale Cooper in Showtime's Twin Peaks television series, complete with rounded corners and a cardboard mini-cassette bookmark! The bookmark measures about 1 7/8' wide x 1 1/4' tall.